It really does in buckets and bucket loads. The only thing you can do is put up that umbrella and keep walking! On9 has been open since the 9th and as much as I am a little late posting this cute short suspender set from MeSewSexy but I wanted to share it with you. It is still available at the event and will make a great addition going into anyones Spring wardrobe. I love these nails so much from Dark Passions I just had to show them off again! hud for the colour of the zipper at the back. Original mesh for now only available fitted for Maitreya. More coming soon. My jewellery is made by Elle Boutique – exclusive for Enchantment ! 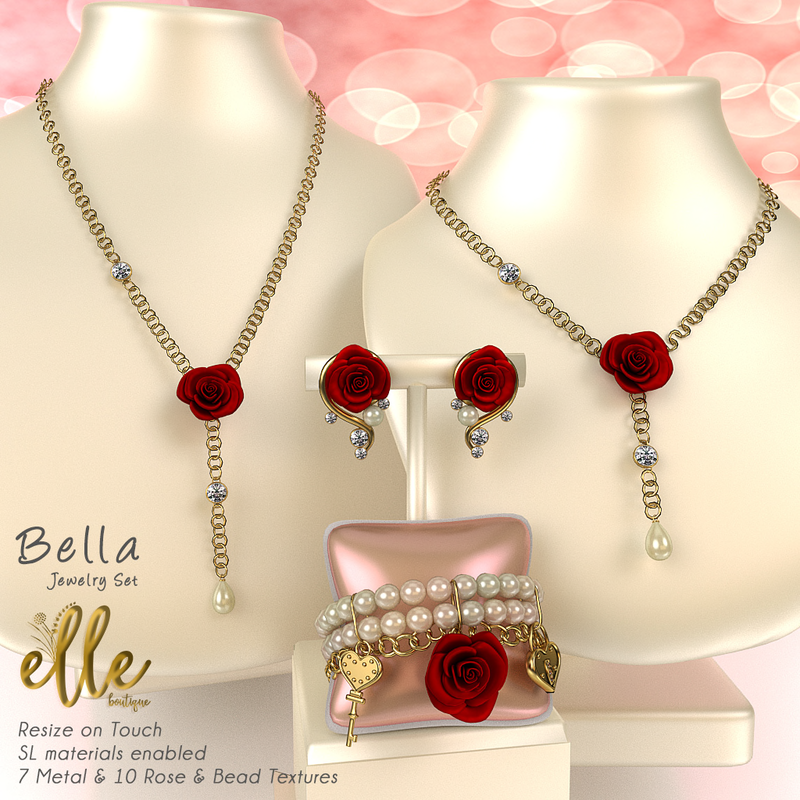 The Bella Full Set contains necklace, earrings and bracelet. Included is a colour change hud to customize as you like for the metals and beads. Also my fingernails are made by Elle Boutique. Mesh nails including hud to change the colours of the nails, roses and gems. This little Dreamer tatto is from QUeen of ink for Designer Circle #173 ! My poses are from the Perfection Set by Image Essentials available at the mainstore. Set of 5 bento poses including mirror poses. Ich habe ein paar schöne Dinge für eure Garderobe und eure Schönheit. mein Kleid incl. Slip ist Brianna von LX Essentials für Ultra Event. Es enthält einen Hud für den Reißverschluss am Rücken. Original Mesh zur Zeit nur erhältlich für Maitreya , andere Größen kommen bald. Mein Schmuck ist von der Elle Boutique – exklusiv für Enchantment ! Das Bella Set beinhaltet Kette, Ohrringe und Armband. Enthalten ist auch ein Colour Change Hud zum Anpassen für die Metalle und Perlen. Auch meine Fingernägel sind von der Elle Boutique. Meshnägel incl. Hud zum Anpassen der Farbe der ägel, Rosen und Steine. Das kleine Dreamer Tatto ist von Queen of ink für Designer Circle #173 ! Meine Posen sind aus dem Set Perfection von Image Essentials – erhätlich im Mainstore. Ein Set mit 5 Bentoposen und Mirrorposen. Shame that the day of love happens once a year, I think it should be every day of every year. This year our creators are out in force with some incredible finds. At The Avenue’s White Night event coming on the 19th of February , its the Gold Event with 35% of an exclusive item for each of the creators. Sinfully Sweet is bringing us some cute platforms, that has an incredible hud to wear all year long.